A San Francisco startup has solved one of the drawbacks with a lot of car-sharing services—though you’ll have to make do with two wheels instead of four. Scoot Networks rents electric scooters by the hour and lets their riders drive them point to point around San Francisco. That means they don’t have to be returned to the same place you picked them up, which is the case with many car-sharing services. Riders reserve scooters using a smartphone app available for iOS. There’s no standalone Android app, but riders can use the Scoot Networks website. Once reserved, riders use their smartphones to start the scooters up. “Instead of using keys we use your smartphone, which is always in your pocket,” said Sophie Lubin, a spokeswoman Scoot Networks. “We take them for a little ride and then we release them into the wild,” said Mike Waltman, vice president of fleet. 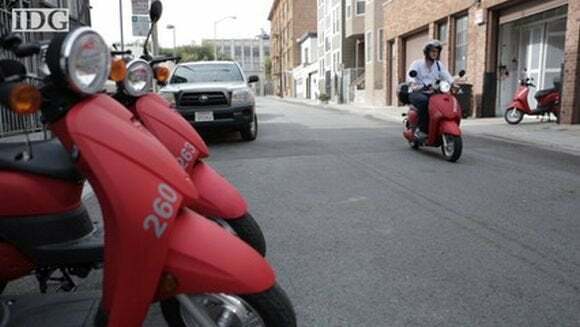 There are different membership levels, but the basic membership is about $3 an hour to rent the scooters. “It’s cheaper than a taxi, faster than taking the bus and much easier to park,” Waltman said. There are some limitations, of course. For starters, the service is available only in San Francisco. Scoot is looking to expand, but Waltman wouldn’t say which cities he’s eyeing next. While Scoot won’t rule out cities with “a real winter,” it’s a lot less fun riding in the snow. The service is able to overcome some of the drawbacks faced by car-sharing services. Besides being able to pick a scooter up at one location and drop it off at another, they’re also a lot easier to park. The scooter’s top speed is around 25 miles per hour, which is enough to keep up with city traffic. They’re not designed for highways. When users enter their destination on the app, it will take riders on a “scooter friendly” path, Lubin said. The routing avoids streets with cable car tracks and steep hills, two driving challenges in San Francisco. Scoot Networks is a seed stage startup funded by angel and institutional investors, according to Waltman. It has a few thousand users in San Francisco, but, like many startups, isn’t profitable.